Berberian, Houri & Touraj Daryaee (eds.). 2018. 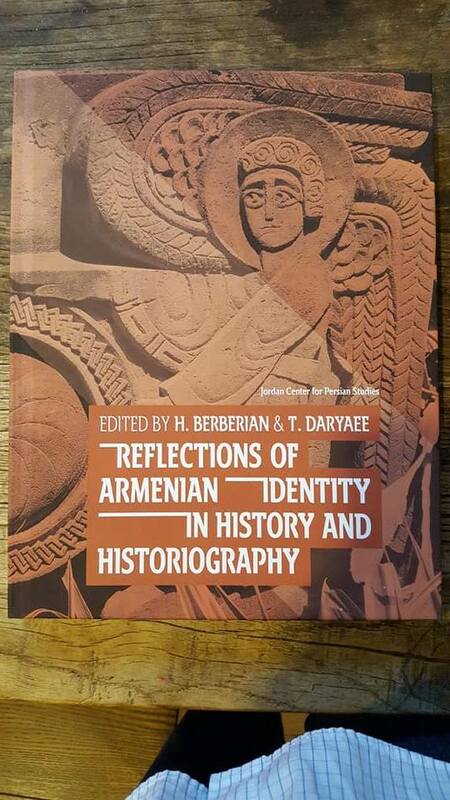 Reflections of Armenian identity in history and historiography. Jordan Center for Persian Studies. This volume is the result of a conference held on the UCI campus in April of 2015. The purpose of this international conference was to explore various aspects of Armenian identity from the remote past to the present. Some of the papers that appear in this collection stay true to their original presentations w hile others have been dramatically altered, even in subject in one case. S. Peter Cowe: The Armenian Oikoumene in the Sixteenth Century: Dark Age or Era of Transition? Hoyland, Robert G. 2018. History of the kings of the Persians’ in three Arabic chronicles: The transmission of the Iranian past from late antiquity to early Islam. (Translated Texts for Historians 69). Liverpool: Liverpool University Press. This book translates the sections on pre-Islamic Persia in three Muslim Arabic chronicles, those of Ahmad al-Ya‘qubi (d. ca. 910), ‘Ali al-Mas‘udi (d. ca. 960) and Hamza al-Isfahani (d. ca. 960s). Their accounts, like those of many other Muslim historians on this topic, draw on texts that were composed in the period 750-850 bearing the title ‘The History of the Kings of the Persians’. These works served a growing audience of well-to-do Muslim bureaucrats and scholars of Persian ancestry, who were interested in their heritage and wished to make it part of the historical outlook of the new civilization that was emerging in the Middle East, namely Islamic civilization. 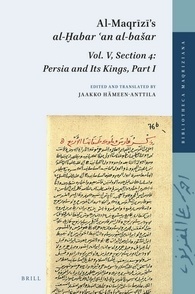 This book explores the question of how knowledge about ancient Iran was transmitted to Muslim historians, in what forms it circulated and how it was shaped and refashioned for the new Perso-Muslim elite that served the early Abbasid caliphs in Baghdad, a city that was built only a short distance away from the old Persian capital of Seleucia-Ctesiphon. Robert G. Hoyland is Professor of Late Antique and Early Islamic Middle East History at the Institute for Study of the Ancient World of New York University. Previous publications include ‘Theophilus of Edessa’s Chronicle and the Circulation of Historical Knowledge in Late Antiquity and Early Islam’ (LUP, 2011). Hameen-Anttila, Jaakko (ed.). 2017. Al-Maqrīzī’s al-Ḫabar ʻan al-bašar. vol. V, section 4: Persia and its kings, part I (Bibliotheca Maqriziana 5). Leiden: Brill. Al-Maqrīzī’s (d. 845/1442) last work, al-Ḫabar ʿan al-bašar, was completed a year before his death. 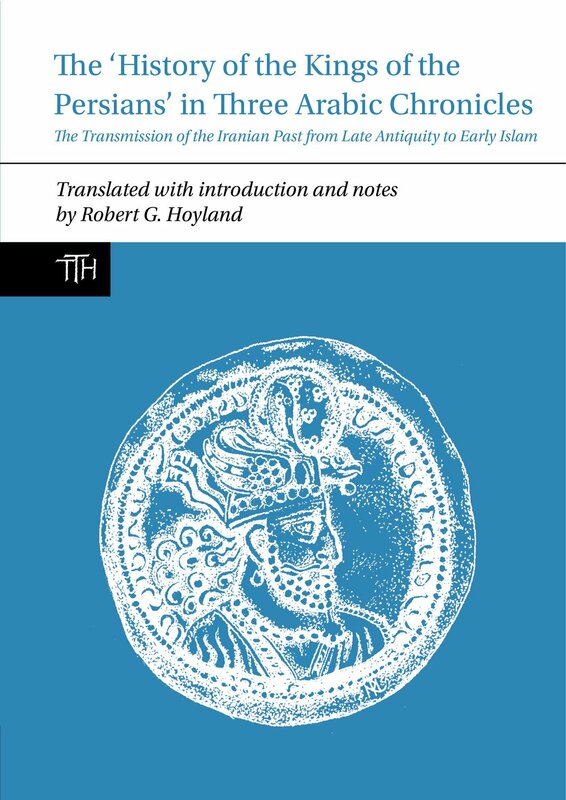 This volume, edited by Jaakko Hämeen-Anttila, covers the history of pre-Islamic Iran from the Creation to the Parthians. Al-Maqrīzī’s work shows how Arab historians integrated Iran into world history and how they harmonized various currents of historiography (Middle Persian historiography, Islamic sacred history, Greek and Latin historiography). Among al-Ḫabar’s sources is Kitāb Hurūšiyūš, the Arabic translation of Paulus Orosius’ Historiarum adversum paganos libri vii. This source has only been preserved in one defective copy, and al-Maqrīzī’s text helps to fill in some of its lacunae. Savran, Scott. 2018. 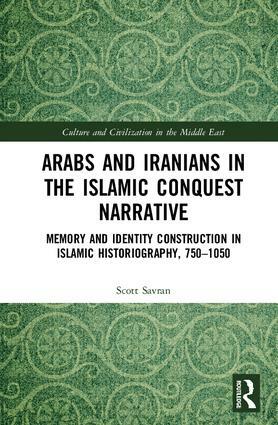 Arabs and Iranians in the Islamic conquest narrative: memory and identity construction in Islamic historiography, 750-1050. (Culture and Civilization in the Middle East 57). London; New York: Routledge. Arabs and Iranians in the Islamic Conquest Narrative analyzes how early Muslim historians merged the pre-Islamic histories of the Arab and Iranian peoples into a didactic narrative culminating with the Arab conquest of Iran. This book provides an in-depth examination of Islamic historical accounts of the encounters between representatives of these two peoples that took place in the centuries prior to the coming of Islam. By doing this, it uncovers anachronistic projections of dynamic identity and political discourses within the contemporaneous Islamic world. It shows how the formulaic placement of such embellishment within the context of the narrative served to justify the Arabs’ rise to power, whilst also explaining the fall of the Iranian Sasanian empire. The objective of this book is not simply to mine Islamic historical chronicles for the factual data they contain about the pre-Islamic period, but rather to understand how the authors of these works thought about this era. By investigating the intersection between early Islamic memory, identity construction, and power discourses, this book will benefit researchers and students of Islamic history and literature and Middle Eastern Studies. Scott Savran obtained his PhD from the University of Wisconsin in 2011. His research focuses on identity-based discourses in early Islamic historiography. Dan, Anca. 2017. “The Sarmatians: Some thoughts on the historiographical invention of a West Iranian migration“. In Felix Wiedemann, Kerstin P. Hofmann and Hans-Joachim Gehrke (eds. ), Vom Wandern der Völker. Migrationserzählungen in den Altertumswissenschaften. 97-134. Berlin: Edition Topoi. The continuous migration of the Sarmatians from East to West is still considered an historical fact. The fundaments of this theory, however, are tricky: the Iranian tie of all the populations on the northeastern edge of the ancient world is too weak to support the existence of one ancient ethnos; our current image of the Sarmatians is the result of loose readings of texts and archaeological evidence, nourished by nationalistic convictions. This paper de-constructs the currently accepted Sarmatian migrations and proposes a new history of the invention of the Sarmatians, through the critical re-examination of the linguistic and archaeological data as well as of the historiographical theses of the last years. Harris, Russell & Marjan Afsharian (eds.). 2017. A Journal of Three Months’ Walk in Persia in 1884 by Captain John Compton Pyne. Leiden University Press. In 1884 an obscure British soldier, having finished his tour of duty in India, decided to make a detour on his trip home in order to spend three months crossing Persia unaccompanied except for the local muleteers. Among his accoutrements he packed a small leather-bound sketchbook in which he not only wrote a journal but in which he also added accomplished and charming water-colour illustrations. The authors’ introduction contextualises this trip made in 1884 against the background of Persianate influence in British culture, and the general cultural background of late Victorian Britain is presented as the subliminal driver behind a young man’s desire to explore, and illustrate, an already discovered country – Persia. Marjan Afsharian gained her MA in the History of Art and Archaeology at SOAS. She currently works for the Encyclopaedia Islamica project at The Institute of Ismaili Studies, London. Russell Harris holds an MA in Oriental Studies from Balliol College, Oxford, and is an established translator of literary works from French and Arabic. He is a contributor to the The Routledge Encyclopedia of 19th Century Photography and The Encyclopaedia Islamica. Hanaoka, Mimi. 2016. Authority and identity in medieval Islamic historiography: Persian histories from the peripheries. Cambridge University Press. Intriguing dreams, improbable myths, fanciful genealogies, and suspect etymologies. These were all key elements of the historical texts composed by scholars and bureaucrats on the peripheries of Islamic empires between the tenth and fifteenth centuries. But how are historians to interpret such narratives? And what can these more literary histories tell us about the people who wrote them and the times in which they lived? In this book, Mimi Hanaoka offers an innovative, interdisciplinary method of approaching these sorts of local histories from the Persianate world. By paying attention to the purpose and intention behind a text’s creation, her book highlights the preoccupation with authority to rule and legitimacy within disparate regional, provincial, ethnic, sectarian, ideological and professional communities. By reading these texts in such a way, Hanaoka transforms the literary patterns of these fantastic histories into rich sources of information about identity, rhetoric, authority, legitimacy, and centre-periphery relations. About the author: Mimi Hanaoka is Assistant Professor of Religious Studies at the University of Richmond, where she is a scholar of history and religion. Her publications include scholarly journal articles on Persian and Islamic history and historiography. Her work as a social and cultural historian focuses on Iran and the Persianate world from the tenth to fifteenth centuries, concentrating on issues of authority and identity. In the field of global history, she concentrates on interactions between the Middle East and East Asia, focusing on the history of Iran-Japan relations. Jackson Bonner, Michael Richard. 2016. Al-Dinawari’s Kitab al-Akhbar al-Tiwal. An historiographical Study of Sasanian Iran (Res Orientales 23). Peeters Publishers. This book is a study of the pre-Islamic passages of Abu Hanifa Ahmad ibn Dawud ibn Wanand Dinawari’s Kitab al-Akhbar al-Tiwal. It is intended for scholars of Late Antiquity. Special emphasis is placed on Dinawari’s exposition of the rule of the Sasanian dynasty and questions relating to the mysterious Khudaynama tradition which are intimately connected with it. Beginning with a discussion of Dinawari and his work, the book moves into a discussion of indigenous Iranian historiography. Speculation on the sources of Kitab al-Akhbar al-Tiwal follows, and the historiographical investigation of the most substantial portion of Kitab al-Akhbar al-Tiwal‘s notices on the Sasanian dynasty comes next. The findings of the book are set out in a narrative of Sasanian history at the end. This book was written with one main question in mind: what does Dinawari’s Kitab al-Akhbar al-Tiwal have to say about pre-Islamic Iranian history? A host of other questions arose immediately: who was Dinawari; when did he live; what did he do; how was his work perceived by others; where did Dinawari get his information and how did he present it; is Dinawari’s information reliable? About the Author: Michael Bonner was an undergraduate classicist who took an MPhil and DPhil in Sasanian history at the University of Oxford. He is a former policy adviser within the Canadian government, and now works as a communications consultant in Toronto.‎ He also teaches Latin and English part-time at the Ontario Academy of Technology. His personal website is www.mrjb.ca. Gharipour, Mohammad (ed.). 2015. The Historiography of Persian Architecture. (Iranian Studies 29). New York, NY: Routledge. Historiography is the study of the methodology of writing history, the development of the discipline of history, and the changing interpretations of historical events in the works of individual historians. Exploring the historiography of Persian art and architecture requires a closer look at a diverse range of sources, including chronicles, historical accounts, travelogues, and material evidence coming from archaeological excavations.